Last of the summer whine….. Researchers from the University of Brighton’s School of Environment and Technology have been busy trampling through marshes and peat bogs since the beginning of December as part of the initial fieldwork phase of the WetlandLIFE project. 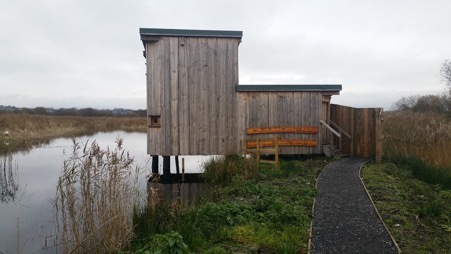 WetlandLIFE is a three year interdisciplinary project funded by the AHRC, ESRC and NERC through the ‘Valuing Nature’ programme (http://valuing-nature.net ). 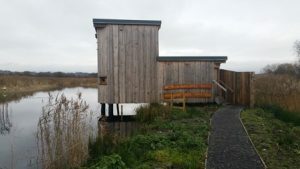 The WetlandLIFE team are studying the cultural, historical and economic values of wetland spaces across England, with case study sites in Bedfordshire, the Somerset Levels and the Humber Estuary, together with an ecological focus on mosquitoes to refine our understanding of their importance within these habitats. Joining forces with Greenwich University to undertake empirical social science fieldwork, the Brighton team are currently immersing themselves within three key wetland ecosystems within England; Shapwick Heath and Westhay Moor on the Somerset Levels; the Millennial and Priory Country Parks in Bedfordshire and Alkborough Flats in Lincolnshire. At this initial stage the Brighton team are familiarising themselves with these uniquely different landscapes – the rural peatlands which sit under Glastonbury Tor’s gaze and the urban infill gravel pits of Bedfordshire with the riverine floodplains where the Humber and Trent rivers meet the next venue in January 2018. This entry was posted in Environmental science, Geography, Life at Brighton, Research, Uncategorized.